One week into Moldova’s Acacia Revolution, as designated by one of its main faces Andrei Nastase, has witnessed tremendous mobilization by civic activists and regular citizens across the country and, indeed, across the world. Social media has played a key role in disseminating information, galvanizing attention and mobilizing participation. It has been particularly effective as most traditional local media, controlled by the ruling establishment, ignore or down-play the magnitude of the protest. Location of the ongoing protests #PMAN (acronym for Great National Assembly Square) has become very popular and facebook and twitter. Another trending hash-tag is #cityofdignity, describing the over 200 tents set up by protesters in front of the Government Building. The main driving force behind the protest movement is Civic Platform for Dignity and Truth (PDA). The platform has proven to be surprisingly tech savvy and enjoys a growing following on facebook, which has become the leading social medium in Moldova for political and social activism. Despite April 2009 protests becoming misleadingly known as Moldova’s Twitter Revolution, this time around it is truly a Facebook Revolution. Even though a Russian competitor ok.ru is still the most popular social platform in the country, Facebook is the preferred virtual public space for Moldovan politicians and activists alike, with Twitter being a distant second. There have been several mobilization campaigns on facebook, pressuring the ruling coalition to keep the highly popular ex-Education Minister Maia Sandu and the well-liked ex-Prime Minister Iurie Leanca in office, but to no avail. Still, it has been a useful exercise in virtual public mobilization, which could not be more real. 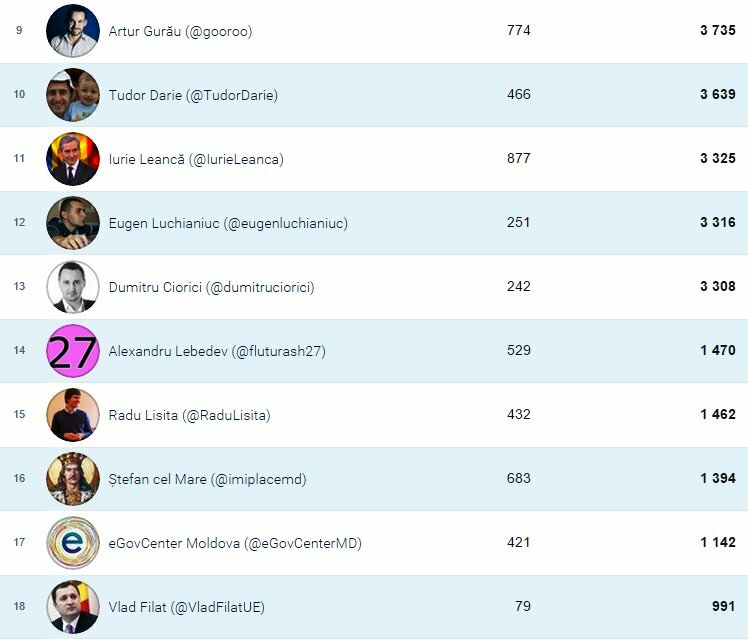 In fact, Iurie Leanca is the most popular Moldovan politician on facebook, putting his former boss Vlad Filat in second place and three-time Chisinau mayor Dorin Chirtoaca in third. It must be a small consolation for all three, as Vlad Plahotniuc, arguably the richest and most influential person in the country, comes in fourth place. Curiously, the flamboyant politician Renato Usatii does not appear in the Socialbaker ratings under the politician category, but rather under celebrity, which, if you think about it, is more fitting. Still, his Russian language facebook account (there are another two accounts with his name in Romanian), has the most followers among Moldovan politicians – 59600. Though impressive for Moldova, it is a far cry from the 1.6 million following Romanian President Klaus Iohannis, of whom 1% are from Moldova. The latter should come as no surprise, given that the most popular Moldovan cause on facebook is union with Romania, liked by 97k, three-quarters being from Romania. However, as with most things, social media is a double-edged sword. As we have seen with regards to the ongoing conflict in Ukraine and the escalating refugee crisis in Europe, social media can be exploited to advance all sorts of narratives, including those based on lies, hatred and fear. Manipulation is the name of the game. Moldovan public sphere, both virtual and traditional, abound in this sort of material. In today’s age of technology, the biggest challenge for a democratic society is to harness the benefits while minimizing the negative externalities of social media. Speaking about Moldova’s ‘Acacia Revolution,’ wholeheartedly engaged civic activists and regular citizens find it difficult to compete with the institutional political machine comprised of media, commentators and bloggers all on the payroll of leading Moldovan politicians, the very people the protest movement is trying to replace. It is certainly an uphill battle, where social media is the most important battlefield. That is why sincere and unrelenting engagement by social activists is crucial. Not committing themselves for the long haul was one of the main caused that brought Moldova to where it is now. Many activists, much like the rest of society, got comfortable when ‘our guys’ came to power, following the April 2009 protests. A whole host of prominent civil society figures were co-opted into the government. In fact, the currently despised Prosecutor General Corneliu Gurin was once a well-respected independent expert on Constitutional Law and anti-corruption reform (sic!). Failure to always keep ‘our guys’ to the same critical standard employed to scrutinize the previous communist regime, gave the new ruling establishment a sense of impunity. They have been taking civil society’s tacit support for granted. This is something that Igor Botan is hoping to address by keeping the Civic Platform for Dignity and Truth out of politics. Botan, a prominent think-tanker and a leading voice in the protest movement, is certainly aware that political temptations may corrupt many activists comprising the Civic Platform, should it turn into yet another political party. Will he succeed is a billion dollar question. Finally, much like the Arab Spring, Moldova’s popular movements of the last couple of years are living proof that activists can and do bring social change, albeit incremental and not always sustainable for the long-term. That is why it is important to fully realize that social media is not only a powerful tool for triggering social change, but also a key asset in maintaining the progress achieved. 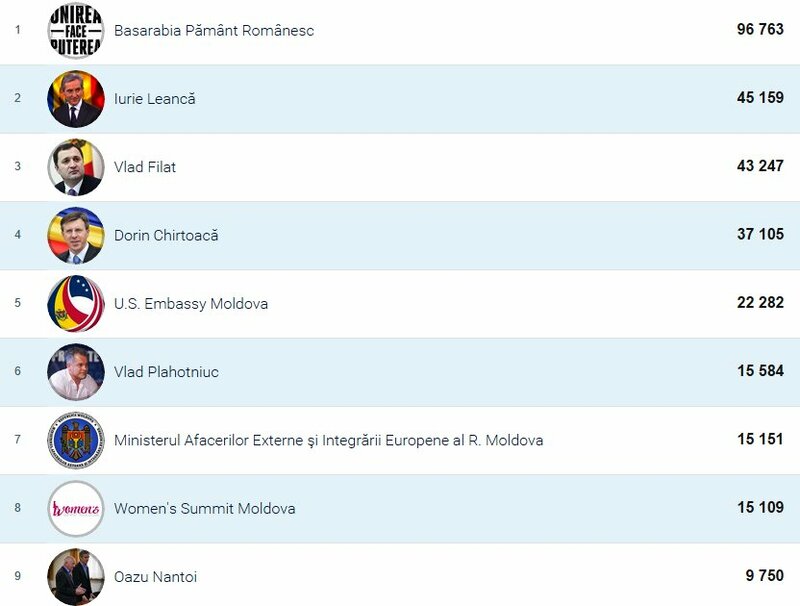 NB: U.S. Embassy Moldova is the 5th most popular page under society category, while the Ministry of Foreign Affairs and European Integration is only 7th. Most encouraging is that Women’s Summit Moldova comes in 8th. PS: For some reason, Maia Sandu’s page does not appear in the socialbaker’s statistics. It may be due to the fact that she identifies as public figure and not politician, thus selection filters do not count her in. This entry was posted in Platforma DA, Political Protest, Politics, Politics in Moldova, Social media and tagged Igor Botan, Klaus Iohannis, Leanca vs Filat, Maia Sandu, Platforma Demnitate și Adevăr DA, political activism on social media, Politics in Moldova, protests 2015, Renato Usatii, Truth and Dignity Platform, Vlad Filat, Vlad Plahotniuc. Bookmark the permalink.